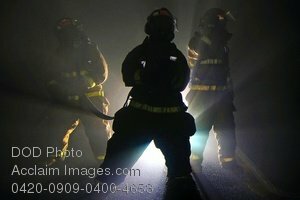 Description: Free, public domain image: Firemen Backlit During a Simulated Fire in a Hangar Bay Aboard the USS Abraham Lincoln. U.S. Sailors simulate fighting a fire in the hangar bay aboard USS Abraham Lincoln (CVN 72) April 9, 2009, in the Pacific Ocean, during a general quarters drill. With the use of a smoke machine, Sailors were exposed to what a situation with limited visibility might be like. (U.S. Navy photo by Mass Communication Specialist Seaman Apprentice Aaron Hubner.